Accused of being partners in pork crimes, Senator Juan Ponce Enrile and his former chief of staff Atty. Gigi Reyes are both spending the weekend in detention. On Friday, July 4, the Sandiganbayan 3rd Division issued a warrant of arrest against Senator Juan Ponce Enrile in connection with the plunder and graft charges filed against him by the Ombudsman. The 90-year-old Enrile is accused of funneling P172 million of his Priority Development Assistance Fund (PDAF) allotment into the bogus NGOs run by Janet Lim Napoles. He also faces 15 counts of graft. ANC reports that on the very same day, the Sandiganbayan 3rd Division also issued arrest warrants against Enrile’s former chief-of-staff Atty. Gigi Reyes, Napoles, Ronald John Lim, and John Raymond de Asis. It may be recalled that Reyes was rumored to be Enrile’s paramour as well, with no less than his wife, Cristina, making the allegation. 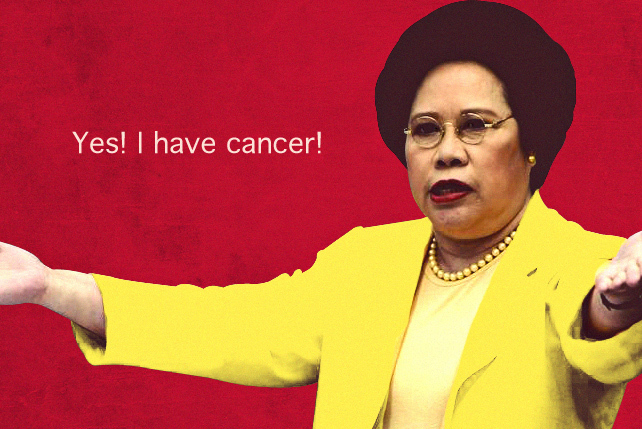 Meanwhile, Reyes denied Mrs. Enrile’s claims. In any case, as Enrile surrendered at Camp Crame, Reyes also surrendered at the Sandiganbayan. But while Enrile is spending the weekend under temporary confinement at the Philippine National Police (PNP) General Hospital, which is also within Camp Crame, Reyes is confined inside the Sandiganbayan’s detention cell. Reyes, as mandated by the Sandiganbayan’s 3rd Division, will be detained at the Bureau of Jail Management and Penology (BJMP) facility in Quezon City. Enrile has likewise been ordered committed to the BJMP facility by next week.